Spring is one of my favourite times of year. Looking out into the garden and seeing bright, cold blue skies and long ago planted bulbs bravely peeking out from the earth is such a happy sight isn’t it? 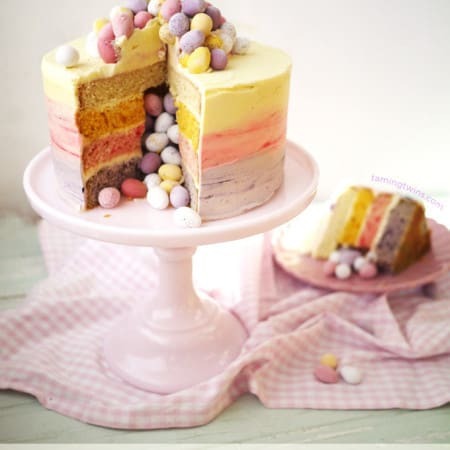 Now, I know this cake is super indulgent but really, don’t the colours just say spring you? Those pastel shades seem so fitting for this season to me. But you know me and my love of giant cakes.. Of course I took it too far and coloured it all and made a giant ombré pinata kind of thing. But it’s almost the law to eat a bag of two of Mini Eggs at this time of year – right? Also, the recipe for Cadbury’s Mini Eggs has not changed. Unlike the controversy surrounding Creme Eggs, these little beauts remain the same as always. A perfect pop of sugary spring colour. The cake would make the perfect show-stopper for an Easter celebration. It’s a whopper but it’s surprisingly simple. Try and ice and fill the cake the day you plan to serve it. Not essential but the mini eggs inside will get a little soft if left any later. Always use paste/gel colours to colour the cake and the icing (I’ll add links below to my favourite ones). When adding the colours to the cake batters and icings, do so a tiny bit at a time and add more if you need to until you get the colour you’re looking for. I like to not quite fully mix the colours in to give a ‘speckled’ effect to both the sponge and the icing. It is easier to ice using a turntable, but if you don’t have one don’t worry. Just put the cake on greaseproof paper on a flat surface and use the paper to help you turn the cake. If you put the cake on a plate, it’s very hard to smooth the sides as the lip of the plate gets in the way. I used a cranked palette knife and a side scraper for this decoration. These are really quite cheap (about £5 for the pair) and a great investment as they make a huge different to decorating layer cakes. 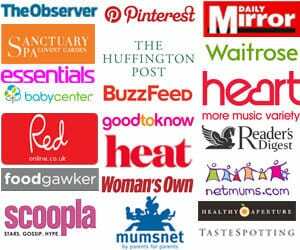 (There are links below to my favourites). Don’t forget to watch the video showing you how to do the ombré icing effect. You’ll notice in the video that I’ve trimmed both the top and bottom of the two ‘inner’ cake layers. This means that when you slice through the cake, you don’t get a brown ‘crust’ in view. Always trim the cake tops to make them flat. Never try to stack a domed cake, it’s asking for trouble! 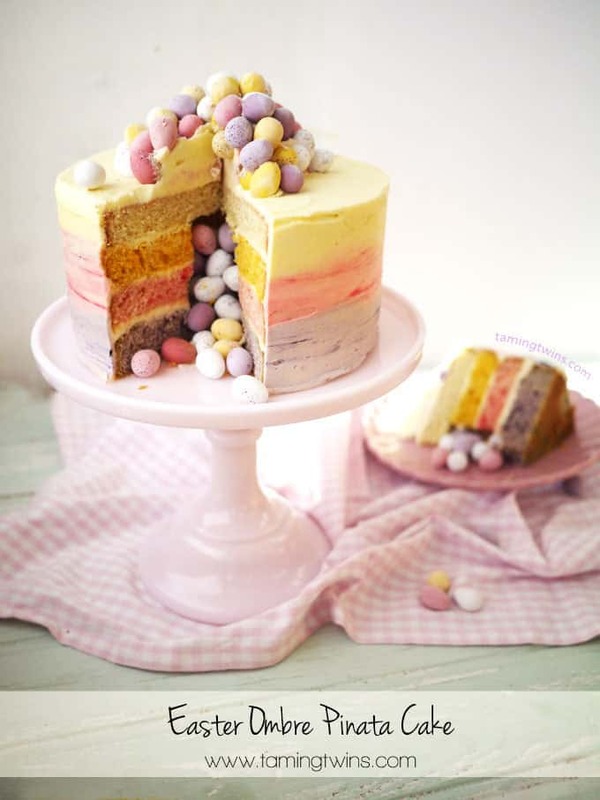 Easter Ombre Piñata Cake - The perfect bake for spring, layers of coloured sponge with pastel buttercream frosting - with a hidden surprise inside! Beat in the eggs until well combined (don't worry if it looks a bit odd, it'll be fine in a moment). Gently stir in the flour and vanilla. If you're using a mixer, do this slowly or by hand. Split the mixture into 4 bowls (about 500g in each). Leave one plain and colour the others with a tiny tiny bit each of Egg Yellow, Ruby and Grape Violet until they are each a pastel shade. Prepare 4 (or 2 at a time if you only have 2) 7" tins. Oil them and line the bottom with baking parchment. Spoon each of the mixtures into a tin and bake for about 25 minutes or until just cooked and a skewer comes out clean. If you've only baked 2 of the sponges, wash them out, prepare them again and bake the remaining 2 lots of batter. When the cakes come out of the oven, leave to cool in the tin for 5 minutes and then turn out onto a wire rack. Meanwhile, make the icing. Beat the butter until very light, pale and fluffy (about 5 minutes in a mixer or 10 by hand). Beat in the icing sugar until total combined and fluffy. Stir in the vanilla. If the icing is a little stiff, add a few drops at a time of boiling water and beat in until fluffy and 'floppy'. Now to colour the icing, spoon out 2 lots, each of 200g of icing into separate bowls. Colour these Egg Yellow, Ruby (pink) and Grape Violet (lilac) using a tip, end of a knife tip, of gel colour. Level the cakes and then use the remaining, uncoloured icing to sandwich the cakes. Cut out the centre core. Fill with Mini Eggs. Use the coloured icing to cover the cake with an ombre, graduated colour effect. Dollop any remaining icing on top to 'glue' a small mountain of Mini Eggs on. 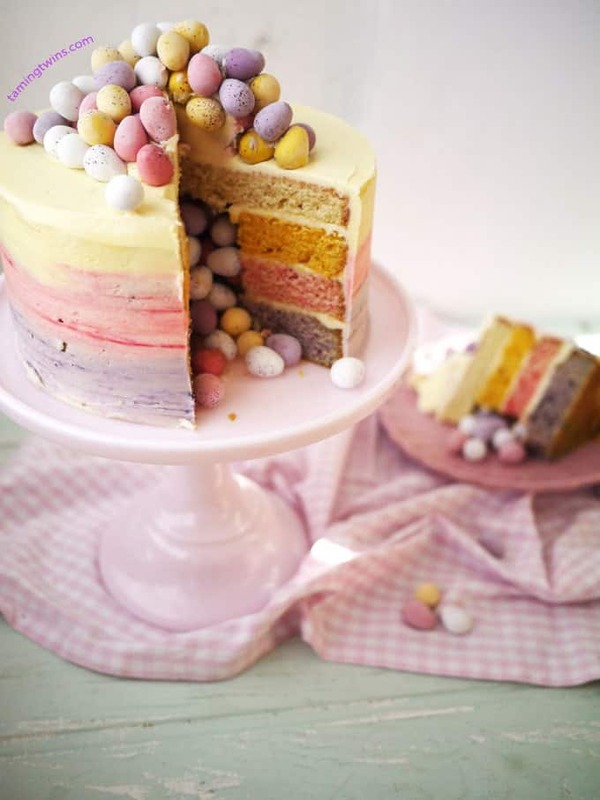 If you’re looking for more cake inspiration, how about a stunning Hazelnut Easter Cake, an Ombré Ruffle Cake, another colourful layer cake, an amazing Rainbow Bundt or a chocolate Pinata Cake? What says spring to you? Creme Eggs, daffodils or giant cakes? That looks amazing, so pretty! My two would love this! Oh my lord, I am in cake love Sarah. Now I need you to come over and make that for me and the kiddoes and we would love you for ever. This is amazing. I totally want one all for myself! 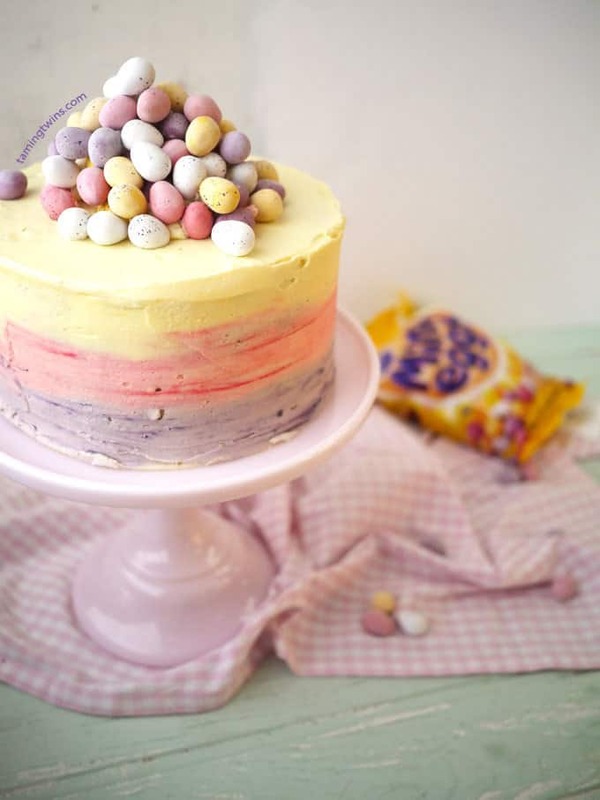 I LOVE how you’ve perfectly captured the shades of the mini eggs in the frosting! Absolutely love your cake Sarah, the icing is simply beautiful. 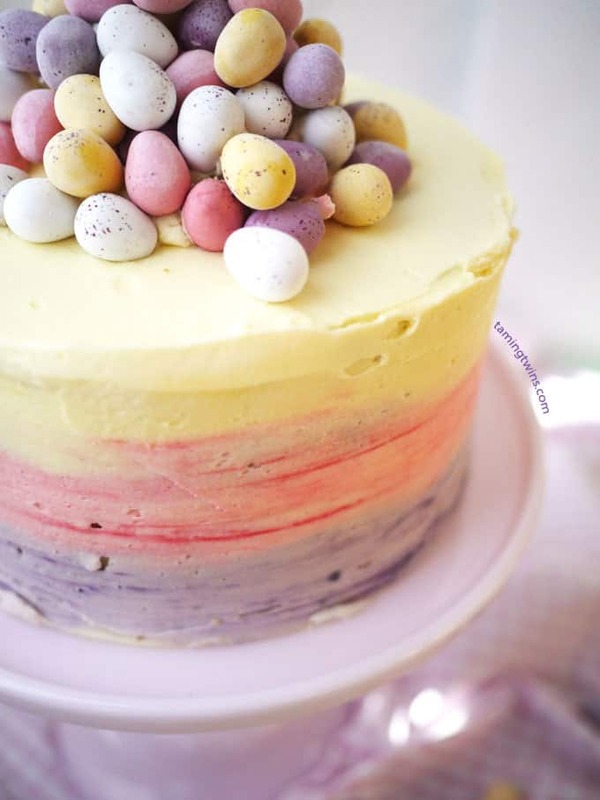 The colours you have used ate Easter perfection, what a stunner of a cake! Wow, you really are the queen of Easter baking! This cake looks absolutely fabulous. Wow this looks amazing! It’s too pretty to eat! There is no way I would ever be able to make anything like this. YOU ARE A GENIUS and I bow down to your baking skills. Your cake looks super cute Sarah and i love the ombre colours. Just wanted to tell you I made this for a baby shower the other day and filled it with jelly babies, it was bloomin brilliant! I was really chuffed with how it turned out! Thank you! The ombre colors are so pretty, and I love how the Cadbury eggs just spill out of the middle. Very nice, I’ll have to try this for next spring! Nossa! Diferente porem bonito. Valeu a recita, vou tentar fazer um assim, espero que fique na mesma qualidade. Will these quantities work with 3 x 8” tins.? Also can you please add the oven temp .? Have added the temperature – sorry! You may have too much for 3 larger tins, the cakes would be very thin. If you only have 8″ tins I would probably try making two and cooking them for a little longer. Hope it goes well!